I photographed a couple of the landscapes at different times of the year. The first above was at the Beaver Lake Nature Center near Baldwinsville, New York. 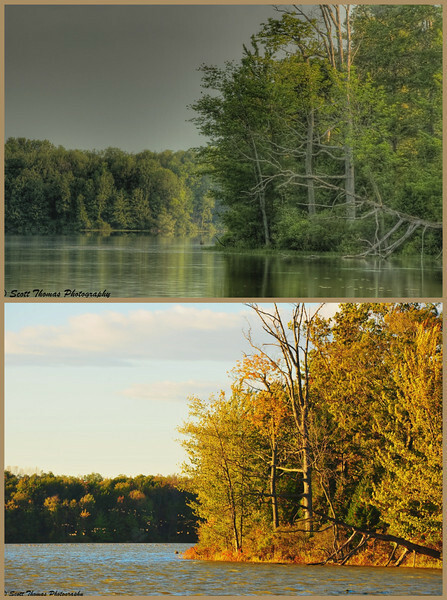 The upper photo was taken in the Spring on a cloudy day which accented the green leaves of the trees along the lake shore. The bottom photo was taken a couple of weeks ago as the Sun was setting bathing the scene in golden light. The leaves had changed from green to yellows, reds and browns. The migrating geese flying in the background tell you it is fall migration time. The second location was at the Theodore Roosevelt National Park South Unit Visitor Center in Medora, North Dakota. These photos show an even greater difference in seasons from the cold and snow of early January compared to the colors of September. In both photos I used the tree for foreground interest against the high butte in the background. The stark difference shows how tough life can be over the course of a few months. Not only were these photos taken at different times of the year but were taken with different cameras. The early year photos done with the Nikon D70 and Nikon 18-200VR lens while, the ones taken in the Fall, the Nikon D700 and Nikon 28-300VR lens was used. What a difference a few months make. Hmmm? This entry was posted in Nature, Photography and tagged 18-200mm vr, 28-300mm, autumn, baldwinsville, beaver lake nature center, fall, landscape, national park, new york, nikon D70, nikon D700, seasons, spring, theodore roosevelt, vr, winter. Bookmark the permalink. It is a very good idea with pictures of the same place under different conditions. In this case the changing seasons. And when they in addition are as beautiful as your images here, they become even more interesting. Hmmm….another long term assignment. Will have to think about it. Cool photos. The second photo from top could be taken in my country Finland, it is so similar. I also like to make comparison with different seasons, so I have been done also. Finland would be beautiful in the fall. I can’t help it, I like the bare tree and butte in winter the best. I have a fantasy of taking a particular photo at the same time every morning for a year, and then stitching the images into a time-lapse film. This will not happen. I lack the willpower for it. But I might manage the same vantage point once a week for a year. Hmmmm. It’s impossible for me to distinguish between the cameras–my eye is less educated than most of your readers’. But I know the new camera helps you to make the image you want to make, and that is enough of a recommendation for me! With images this small, it is hard to tell. For me, the new camera’s images take about half the time to work on. Lots of times, I don’t have to do anything to them. Saving me a lot of time. That would be one tough project on a daily basis. A week might be work for you. Got a location in mind? I like the way you represented the seasons this way. The top two are my favorites but that probably has a lot to do with autumn being my favorite season. I’ve been taking a series of photos of a pond every morning for the past 30 days. It’s interesting to watch how it changes. It will be even more interesting to see the progression in another 30 or 60 days when all of the leaves are gone from the trees and the snow starts flying. What a fascinating project! Read the last couple of posts. Will read more soon. I love the first two… much more my type of landscape than the last two. You’ll have to repost them next year, along with the matching summer and winter shots. What an interesting and beautiful juxtaposition ! The first two pictures look entirely different to me, I mean not in the same place at all. Maybe because of the more foggy look of the first one ? As for the second set, the contrast is more evident of course and my preference goes to the alpine type. Yes, I agree with Carsten, this type of pictures could be a challenging assignment. Good eye, Isa! The top photo of the first two photos was created using 3 bracketed photos to create the final HDR (High Dyanmic Range) photo. The second one was a single photo thus it has a totally different look and feel to it. Hmmm…another vote for an long term assignment. 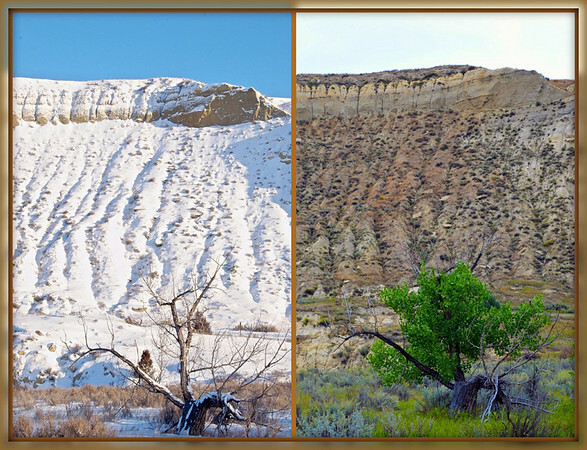 I love to see photos of “before and after”, or as you have done here – the same place at different seasons. Every one of them nice, but the blue sky and white snow catched my eyes immediately. It could be fun if we, bloggers, took a photo 4 times a year at the same days. And made a day for showing them. Oh, boy, this is looking like a go. How about the four times in the year being the First Day of Winter, Spring, Summer and Fall (or within a week of that date)? That’s actually a pretty cool idea, Giid. Scott, maybe you could make this a long term assignment? Very cool shots! Nice job! I like the first photo best, it looks so peaceful and calm. That is was. Much different than the second one as it was quite breezy and I had to use high shutter speeds or the leaves would blur. I love these photos of how different landscapes can be in different seasons. How do you feel the difference between your camaras and lenses? The difference in performance camera and quality of the images is like night and day to me. Hard to see with web sized photos. Of course, jumping up 5 years in technology, I would expect nothing less and the Nikon D700 delivers. I have missed most of the great days around here myself. This pond is in a valley so the trees are about a week behind most of the area. A week ago, we had some windy weather which stripped most of the trees outside of the valley. OK, so when is the First Day of Winter? Gotta find my snowshoes. Or maybe not. You just never can tell about December. As for the weekly practice, I was thinking about the view from the deck. Or maybe the view OF the deck. I’ll find out what I’ve decided when I see myself doing it.